Happy Friday, everyone! It’s time for a Perfect Picture Book review and activity. And if you’d like some more wonderful picture book reviews, please hop over to Susanna Hill’s blog. It was hard to decide which picture book to review for today. Since I’m following Kristen Fulton’s 52 Weeks of Charting Non-Fiction Picture Books, I’ve got a ton of amazing non-fiction to chose from. And because I’m also participating in Carrie Charley Brown’s ReFoReMo , I’ve got a huge pile of picture books that I’m reading as mentor texts. Hmmm…maybe I can combine both challenges and use a book that is one of Kristen’s 52 which I will also be using as a mentor text for a picture book I am writing. “When Stravinsky composed music all by himself, his piano trilled an orchestra with violins and flutes, trumpets and tubas, and keetledrums that lightly pom-di-di-pommed with the ringling nad tingling of cymbals and bells. But he dreamed of making something different and news. Wonderful read aloud…the text is filled with fabulous words that young children will love – how about pom-di-di-pommed? Children love music and they love to make their own music. 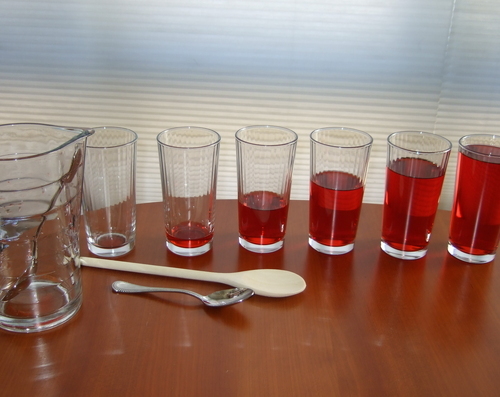 You will need: Several glasses or glass bottles, food coloring, water, wooden spoon, metal spoon. Arrange the glasses in order of water level. Tap each glass gently – each glass will sound a different note. Try it first with the wooden spoon and then with the metal spoon. Maybe you and your child can play a simple tune like Mary Had a Little Lamb. This entry was posted in Perfect Picture Book Friday and tagged Carrie Charley Brown, Kristen Fulton, Lauren Stringer, Make a Glass Xylophone, Susanna Hill, When Stravinsky Met Nijinsky by viviankirkfield. Bookmark the permalink. Books like this one are so important with public schools cutting funding for music programs. Thanks for sharing! This is my kind of story! 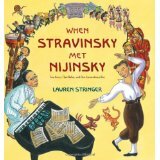 Lovely pairing of Stravinsky and Nijinsky in a moment in history. I love the Rite of Spring – even figure skated to it in a college ice show. Lovely review with great activities. I’m currently using this one as a mentor text for a pb I’m working on about two artists who collaborate. It’s great! Looks terrific, Vivian. You might also like the old film (a beaut!) The Red Shoes, or maybe have being from the NY area? Oops – maybe you’ve seen it, is what I meant to say! Great activity, Vivian. Wow, I’d love to create something so audacious it polarized readers! We see the grandchildren soon, Vivian, and making your glass xylophone is on my list of fun activities! This book is already on my “gotta read” list…. Rites of Spring – what a perfect topic for today. Here, the rites of spring involve a snow shovel and much huffing and puffing. I have been trying to find this book…now I really need to get a hold of it. Thank you for sharing! What a great title! I just want to sing it!! I think the title is great too and love the glass xylophone.